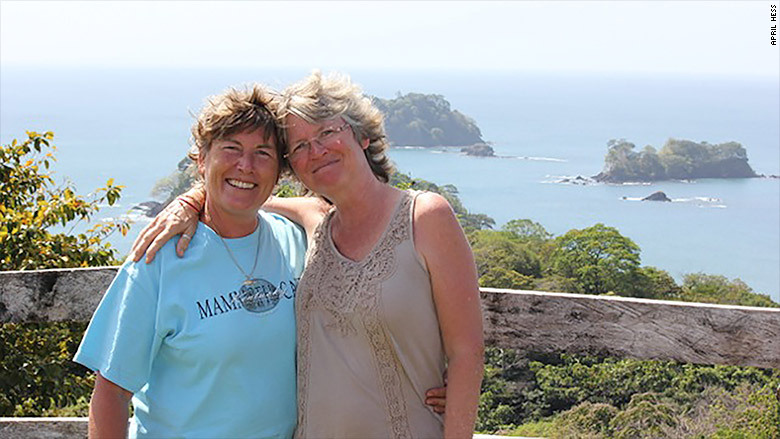 Peg Fairbairn and April Hess weren't able to live the retirement they dreamed of before moving to Panama. Live by the ocean? Check. Retire early? Check. Don't go broke doing it? Check. Peg Fairbairn and April Hess will tell you they're living the dream. They moved from Austin, Texas, last year to retire in Panama, at ages 58 and 53, respectively. They live by the beach, say they have all the comforts that they were used to at home (mostly), and do it all on a budget of $2,133 a month. 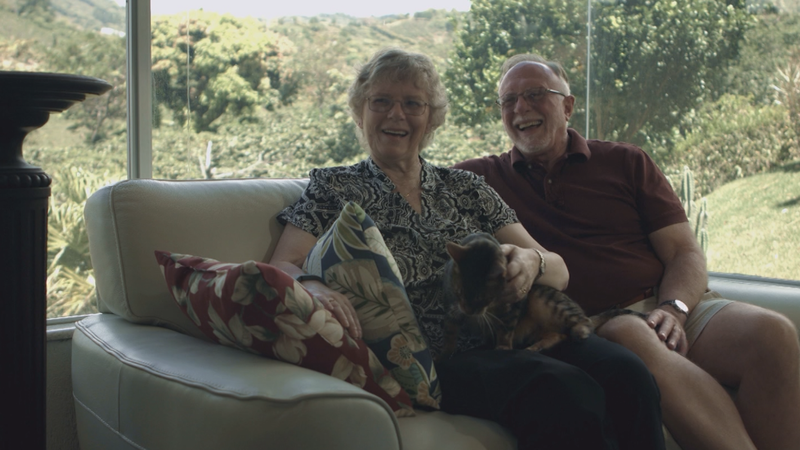 Moving abroad in retirement isn't for everyone, but for this couple it was ideal. "We couldn't afford this in the States," Hess said. "Even if we didn't move near a beach and stayed in Austin, we'd still have to be working." They can see the ocean from their house and spend their time going to the beach, practicing Spanish with their neighbors and making good friends with other expats from the U.S.
"It's fabulous. We don't know what we do all day, but we're not bored," Hess said. Moving abroad was always in the back of their minds. They finally made the move last year after selling their home and most of their belongings. Fairbairn was a teacher for 30 years. She taught eighth grade earth science when she retired in 2008 with a monthly pension check of $2,935 (after taxes). When the couple still lived in Austin, she had to substitute teach to make ends meet while Hess was still working as a bookkeeper. Now that pension check is all the couple needs to live on. 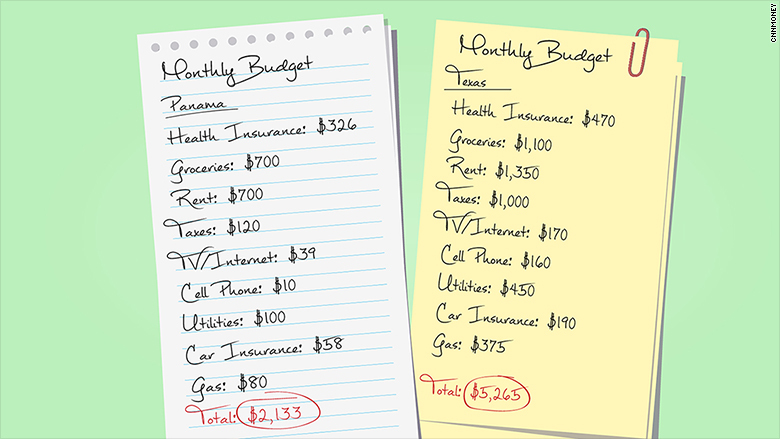 Rent, groceries, utilities, phone bills, TV, Internet and even their international health insurance is all cheaper than what they paid in Texas. Their savings go toward a house they're building. Thanks to a tax break, they won't have to pay property taxes on that home for the next 10 years. Besides the financial benefit, the couple chose Panama because it's close enough to the U.S. that they could get home quickly to visit family and friends. They can also use the U.S. dollar there, so their retirement income wouldn't fluctuate with the currency. Panama and other Latin American countries actively recruit American retirees with easy-to-obtain visas and other perks. Fairbairn got a "pensionado visa," which is granted to anyone who has a steady stream of at least $1,000 coming in each month. That could be a pension, or even Social Security from the U.S. government. With it comes discounts on hotel stays, movie tickets, prescriptions and at restaurants. Hess was granted a "friendly nations visa" by depositing at least $5,000 into a Panama bank account and opening a Panama corporation, which cost a fee of $650. It's a business in name only. There are more than 21,000 U.S. retirees receiving Social Security in Central America and the Caribbean, according to the government. Retiring abroad makes sense for people with a modest amount of savings, looking to live on between $2,000 and $5,000 a month, said Kathleen Peddicord, the publisher of the e-letter "Live and Invest Overseas" who is also an expat living in Panama. Still, the couple found out that the move itself was more expensive than they had expected, topping about $14,000. They had to hire an attorney to help them through the visa process, which cost about $5,400 altogether. They paid $6,000 to move their two dogs and two cats with them and $500 for their eight suitcases. There are some things they miss. "We enjoy the country, the beauty and the beaches, but we miss the occasional happy hour and going out to eat," Fairbairn said. They settled in Panama's "interior," which is fairly rural. It's a 10-minute drive to the nearest town, which has a small market, bank and gas station. For anything else, they have to drive an hour to Santiago. Panama doesn't have a home mail delivery system, so ordering something from Amazon is out of the question. And then there's the language barrier. Neither of them knew any Spanish before they moved. Although they spent a few months studying at a school when they first arrived, they still struggle sometimes. "The biggest problem is when you want to be part of the community and express your personality to establish relationships, it's impossible without Spanish," Fairbairn said. But they've still made a lot of good friends in the expat community, which they say consist of a lot of "like-minded" people. "We were pretty brave. But it's been everything we expected. In the States we'd still be working and not being able to enjoy our two passions: travel and the beach," Hess said. Did you retire early? Tell us about it and you could be featured in an upcoming story on CNNMoney.